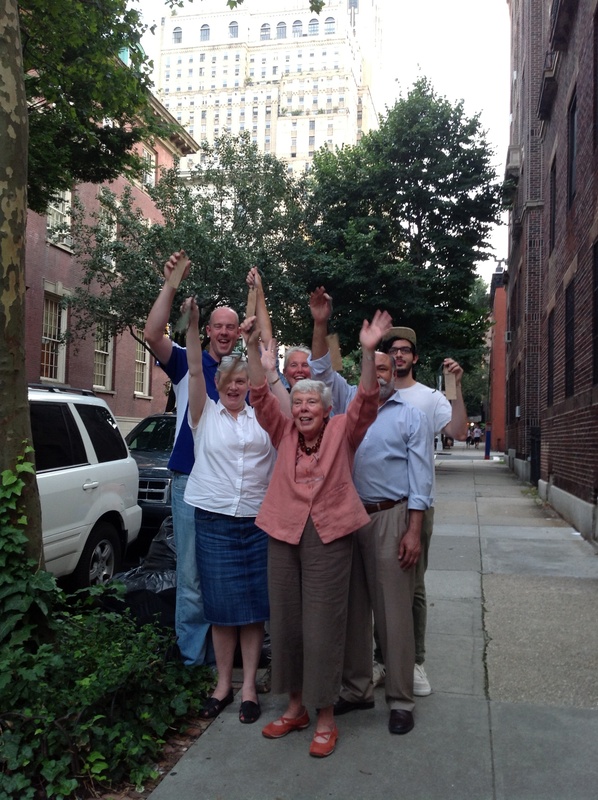 There are lots of street trees in Brooklyn Heights; is there room for one for Aaron? Since his death at the age of 19 I’ve wanted to plant a tree for this beautiful great-nephew. But how and where? I found that New York City would provide a free street tree to any property owner who asked, but the family’s apartment house has no tree pits and that would be a big expense. Then on the website I spotted a link to “Adopt-a-tree”. And there I found my answer. The city wants people to adopt trees to watch out for them, to water them if needed, to place fences and plant flowers around them. We couldn’t prolong Aaron’s life but perhaps in his name we could prolong the life of a special tree. His mother chose a tree two blocks from the apartment house and just across the street from her workplace. Last night we dedicated Aaron’s tree. His parents, his brother, an aunt and uncle, his grandmother and I wrote tree-grams and carried them down the street. 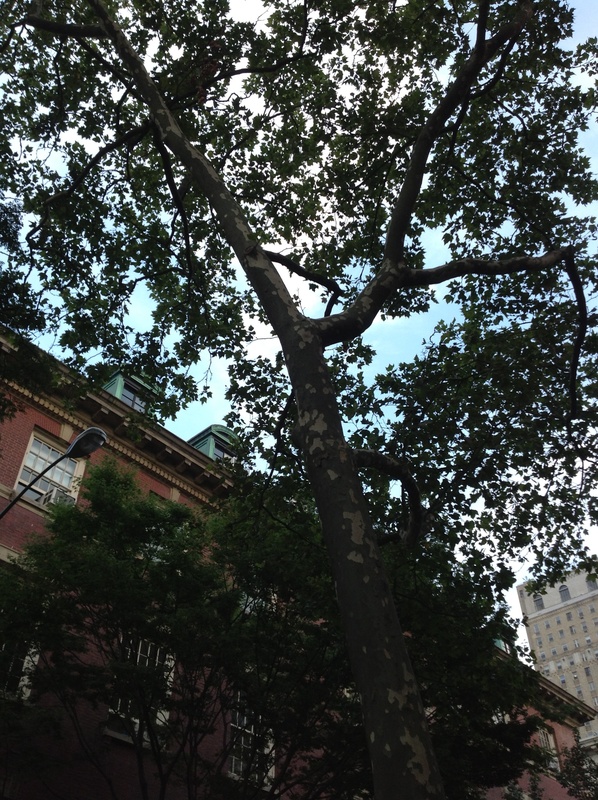 Amy knew that it was the second London Planetree on the block, but second from which corner? After a group discussion, we chose the one we thought needed the most love. Then the problem of hanging the tree-grams came. Amy had told me the lowest branches were way up there and I thought we could use a ladder and also told her about the dedication where the kids had ridden on the shoulders and heads of the adults to hang the tree-grams. Well, six foot three Amos standing on six foot eight Jim’s head wouldn’t get near that lowest branch. Does anyone have an “in” at the fire department? Ah, let’s hang them on the little fence around the tree and on the ivy that’s growing up the trunk. People will have to bend down to read them but that’s ok. I tried to remember the ritual used by the cyclists on the Tour des Trees, but could only remember rubbing our hands together to get heat which is energy and then passing it on to the roots. Before I could tell everyone to aim their hands to the roots they put their hands on the trunk of Aaron’s tree. I think that could symbolize bringing energy to the whole tree. 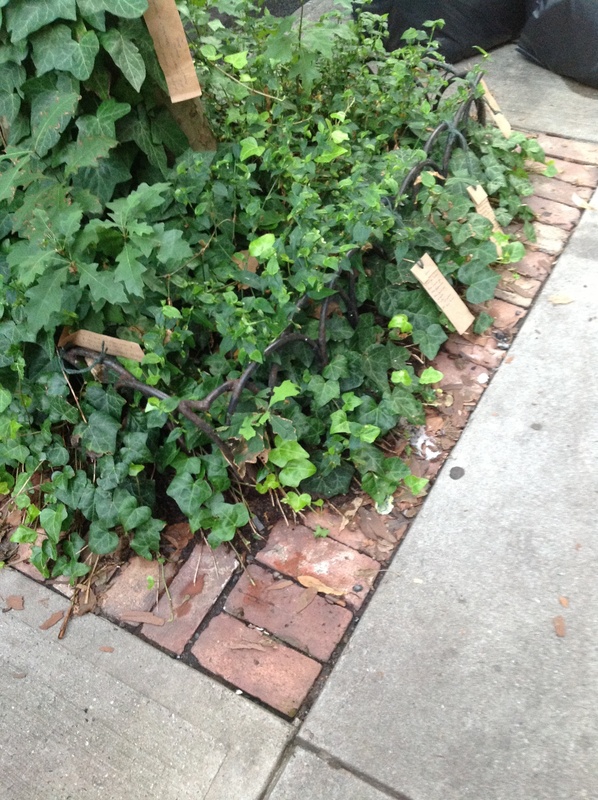 We talked plans for the tree pit – perhaps a new fence, perhaps bricks from the family home in Glencoe, Illinois, perhaps some flowers, but definitely getting rid of the ivy. We walked back down the street and later in the evening rain came to water our special new tree. Now there is an adoptee in the Susie Forest.